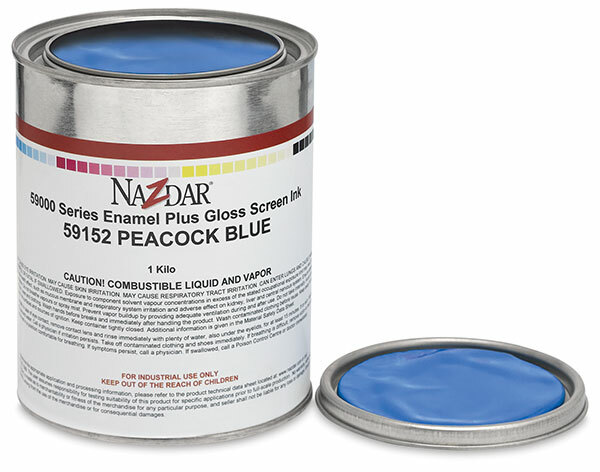 A glossy, solvent-based enamel ink formulated to screen print on a wide range of hard-to-adhere-to surfaces such as glass, metal, wood, and some plastics, Nazdar 59000 Series Enamel Plus Gloss Screen Ink is ideal for outdoor signs and displays. It can be used with all types of screen fabrics and stencils. These inks air dry by oxidation to an extremely flexible and glossy finish within four to six hours. They can also be heat-cured at 180°F (82°C) for approximately 30 minutes. Once air-dried or cured, they're weatherproof. 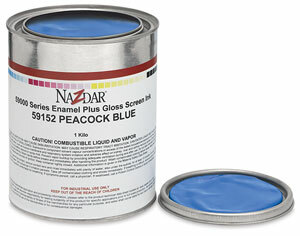 Nazdar 59000 Series Inks should be thinned up to 15% with Nazdar Gloss Coating Varnish to assure proper ink flow. During use, add only enough ink to the screen to be able to print for 5-10 minutes. Add additional ink in small increments throughout the print run to maintain screen stability. Thoroughly mix the ink prior to printing. Improper mixing can lead to inconsistent color and ink performance. One gallon will cover 800–1,000 square feet (about 80–100 square meters). For over-printing, use 59135 Gloss Coating Varnish. Use 59120 Transparent Base to increase coverage without affecting viscosity. It can also be used to obtain roller-coating consistency.